Pasta associated with a tasty mixture of chicken mushrooms - Lyophilized. 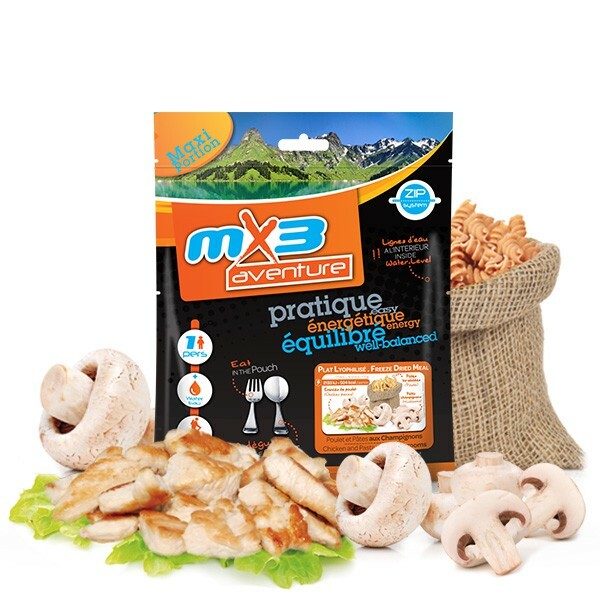 Chicken and Pasta with Mushrooms MX3 is the simple, nourishing dish. Prepared with beautiful pieces of chicken and succulent mushrooms added a creamy sauce. Precooked pasta 62,1% (wheat) , lyophilised chicken 15%, modified potato starch, vegetable palm oil (lactose (MILK) and MILK proteins), milk powder, flavours (whaet), salt, mushrooms (1,3%), yeast extract, thickener : guar gum, onion, pepper..